WASHINGTON, D.C., February 13, 2019 — Today, a diverse group of trade associations, businesses, and advocacy groups launched the “Pass USMCA Coalition,” an alliance advocating for the swift passage of the United States-Mexico-Canada Agreement during the 116th Congress. The coalition is focused on supporting swift passage of the USMCA by highlighting its unique benefits to America’s workers, consumers, businesses, and economy. Trade with Canada and Mexico supports 14 million U.S. jobs across many sectors. These workers — and the industries they support — drive billions of dollars in annual U.S. exports. In 2017, the United States exported more than $275 billion in goods to Mexico and nearly $350 billion in goods to Canada. The USMCA further strengthens North American trade relationships — and empowers U.S. businesses to export even more goods to Canada and Mexico each year. The deal promotes U.S. exports, enhances intellectual property protections for U.S. creative industries, and boosts resources for America’s small businesses. “The USMCA is a win for America, “said Rick Dearborn, executive director of Pass USMCA. 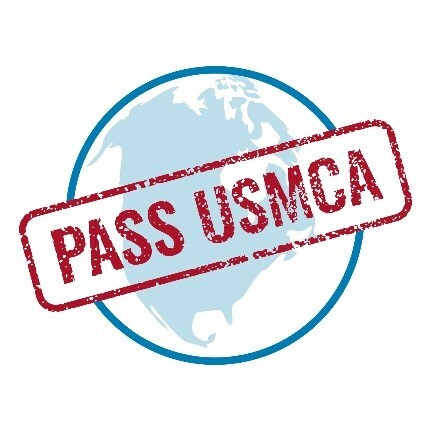 About Pass USMCA: Pass USMCA Coalition is a group of trade associations and businesses advocating for the swift passage of the United States-Mexico-Canada agreement. The provisions outlined in USMCA will defend American jobs, cultivate innovation, and encourage business development, spurring growth for local, state, and national economies.